Our contracts have ended and the wife and I have moved from Jerusalem to small town Ontario, somewhere between Lebanon and Carthage. A little over a week ago, we were walking through the Mediterranean, and now we are knee-deep in snow. At least we have Tim Hortons nearby. 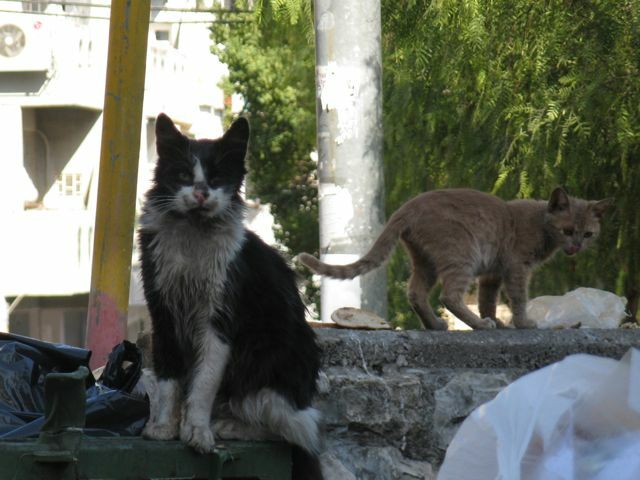 Fare thee well, oh dumpster cats of Jerusalem. May you find shelter from the summer heat and the winter rains. May your dumpsters be overflowing with tasty chicken scraps. May kindly old ladies continue to leave out generous piles of food for you. And may your offspring be as numerous as the stars in heaven… although this already seems to be the case. Thanks to everyone who supported the site and spent even a second of their time on this site in the past year. In particular I’d like to thank all the students who were brave enough to give online tutoring a chance. It continues to be a thrill to just open my computer and video chat about organic chemistry with people all over the world. Location matters less than it ever did before. “Office hours” can be held from anywhere. I’d encourage anyone who has specific knowledge of a niche subject to put up a shingle for themselves and offer online consulting of some kind. Chances are that there’s all kinds of knowledge in your head that has potential value to someone. I’ll be back Monday on a regular posting schedule. I stumbled across your posts of the cats of organic chemistry and read them all. These are brilliant! I was an art major in college 10 or 12 years ago. I don’t know anything about organic chemistry, but I like cats. Reading your posts, I think I actually learned a little something today. =) The writing is fun and informative, and the pictures and illustrations get the info across very well. Thanks for these! Great website, thank you so much! This website is absolutely amazing! Frantically searching the web to better prepare me for my midterm tomorrow, I stumbled upon your site and now I’m hooked! O-Chem has been like a foreign language to me all semester, until NOW! Your method of teaching is extremely engaging and super helpful. You rock! Thanks so much! Thanks! Some days I wish I could use cats to teach everything. These cats made my day! Organic Chem was a nightmare for me, but now with your blog it seems a piece of cake :) Thank you so much James. I was struggling to understand all the different terminology but this made it so much more clear. You did a much better job than my professor or my text book. I will definitely keep using your posts for other topics as well. Thank you so much! Hey, imagine my surprise when I am reading a pleasant post on cats (not chemistry) and I find the writer is a newly-minted fellow Ontarian. If you happen to be in the Hamilton or Toronto areas feel free to drop me a line, I’m always interested in meeting up with fellow chemists, I mean, catists. This was a positively brilliant series of posts! I love your Organic Chemistry Cats. I share your blog, especially these pages, with every pre-health and science student that will listen to me. This blog is probably the best thing to ever happen to me, I wish I’d known about it sooner. Thanks for making learning this stuff interesting! I have my first OChem exam on Wednesday and could NOT wrap my head around the concept of distinguishing enantiomers vs. diastereomers. I’ve read my text book, gone to all my lectures, look at several other sources online, but after reading all your cat posts, I feel like I actually understand how to tell the two apart. Keep doing what your doing, the education system is often tailored towards a certain type of learning but I am the type of person that needs visual aids and connections to real life scenarios in order to grasp the concept. You are a great professor, regardless of whether that is the job title you write on government documentation. I couldn’t thank you enough!! Your posts are so helpful. I’m studying for an O chem exam right now and your explanation of stereochemistry using cats is wonderful! Thank you for the tremendous help! Currently studying for my 2nd OChem midterm, and after the first one didn’t go so well.. this site has saved me! This site is absolutely amazing! Thank you so much. Great cat posts! Thanks…a new way of looking at it. Might be just what I needed! :) if not, at least it was an enjoyable read.